No, I’m not boasting. That’s the name of the recipe. Your second question is probably, “What’s a galette?” The answer, according to our friends on Saturday night, is, “I don’t care. Is it dessert? Did Kristina make it? I’ll have some.” We decided it had been too long since we’d had people over for a fire, so planned one for this past Saturday. Our friends Megan & Doug brought their family, so we thought we’d start with a BBQ with them, since we figured the kids wouldn’t last all that late for the campfire. BBQ: ribs, corn, potato salad (from my garden! 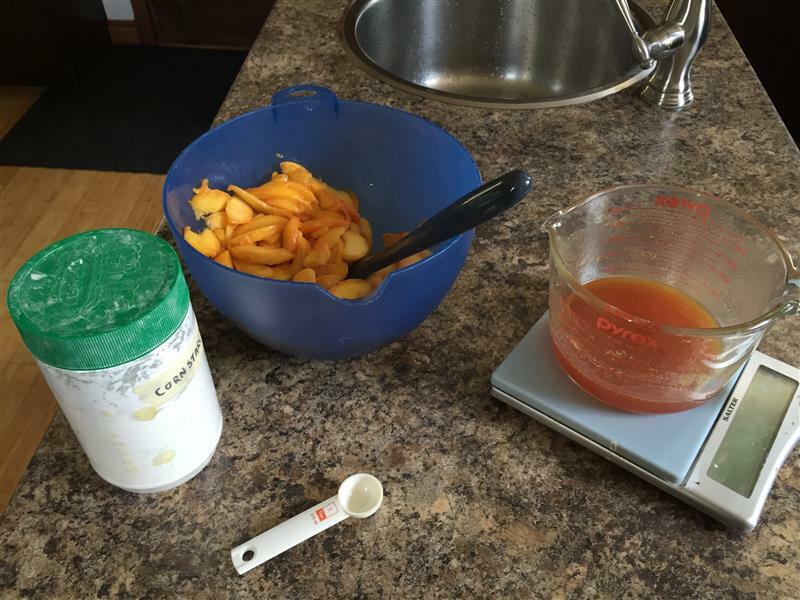 )… what could be better than peach pie for dessert? Nice timing on the schedule, Marie! 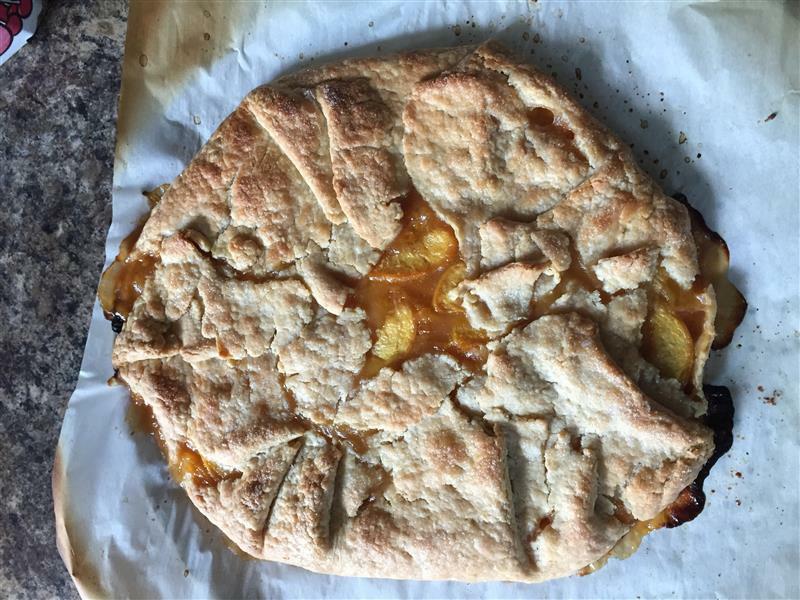 Peaches are perfectly in season here, too. 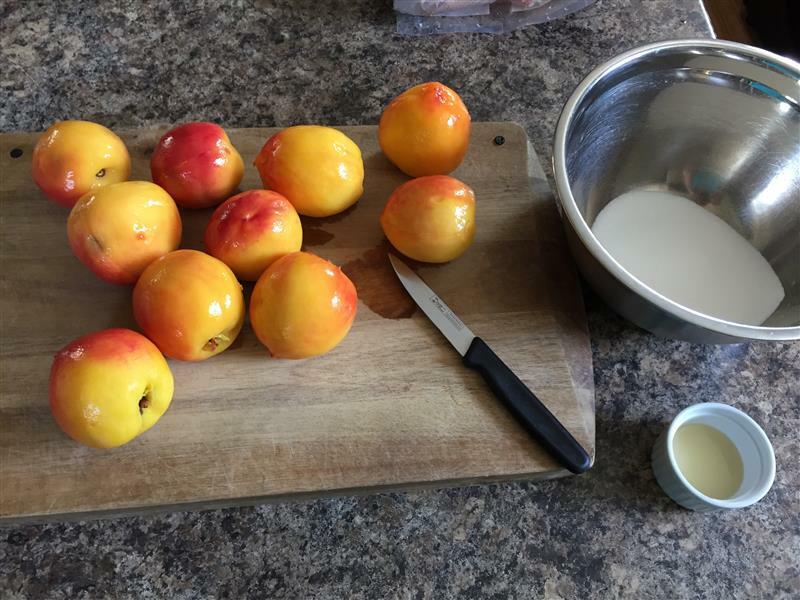 To skin the peaches, place them in a pot of just-boiled water for 1 minute. Then run them under cold water. The skins rub/peel off pretty easily. 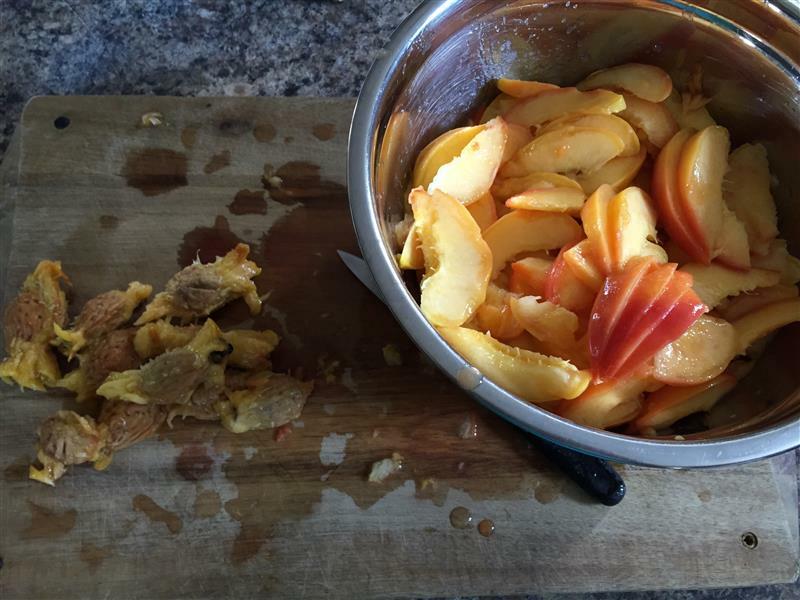 Then you’ve got a pile of slippery peaches to deal with. I tried cutting in half, then removing the pits, but they just ended up a mess, so instead I sliced around the pit, then pulled off a few slices at a time. That seemed to work out well. 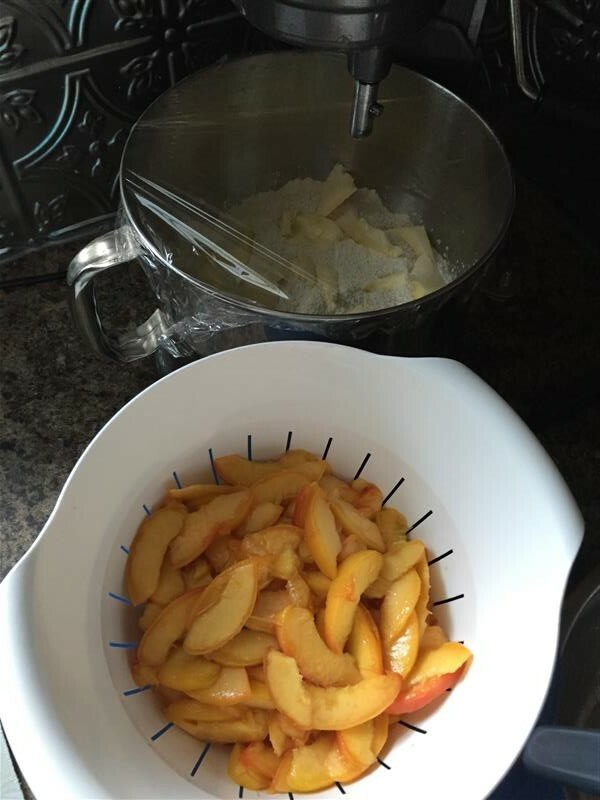 Mix the sliced peaches with sugar & lemon juice, then let that sit for 1/2 hour or up to 1.5 hours. That’s called “macerating” and it causes the fruit to release some of its juices. 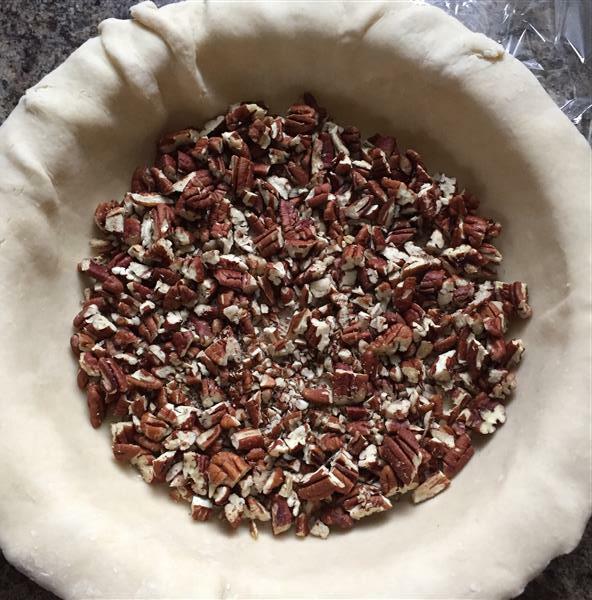 In the meantime, I kneaded my bread (lurking in the corner in the next picture) and got the pie crust rolled out. Take the juice recovered from the peaches, and boil it for a while, reducing it by about 1/3. I actually had more than a cup of liquid, because I (sort of) doubled the recipe. Well, I doubled the filling, but apparently didn’t roll the dough out thin enough, or didn’t have quite enough dough, since I’d put together a bunch of scraps & half of a double-crust pie recipe, out of the freezer. The galette kind of exploded a bit in the oven, but fortunately, I had laid parchment down over the pizza pan, and it didn’t make a mess. I was even able to gently slide a pizza peel under the galette and lift it up off the parchment for serving. I forgot to get a picture of that, so you’ll just have to believe me. I sliced it with a pizza wheel, too. It seemed appropriate, given the serving vessel! Jay really liked this one, because it’s more crust than fruit. 🙂 I think I prefer pie in a pie plate, because it just looks better, but I can’t say I minded this, either. 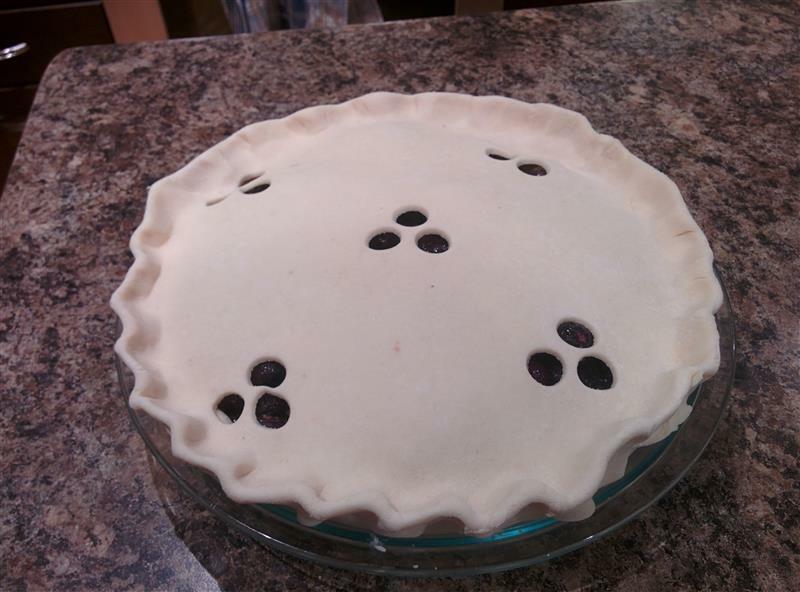 I might get better at rolling the pie crust and folding it prettily, if I did it more than once. But, next week’s a new scheduled recipe, so onward we go! Er.. All that to say, I might be late with my baking/posting next weekend. Or maybe I’ll do it on Friday and be early. We’ll see. 1 of our scrum masters, who, yesterday, was wearing a shirt that read “Don’t read the next sentence. Oh, you little rebel. I like you.” Today, it was a loading symbol with “Sarcastic comment loading. Please wait.” Matt‘s all kinds of awesome. Me – a former developer, turned product owner/product manager. I think I managed to keep my place in the group after turning to the “dark side,” solely on my baking merits. Oh, and a VP. VP ALM Solutions or something like that. I have no idea who invited him to the group. This week, Doug made chicken tortilla soup for us, and it was really tasty. I’m putting that recipe (or Jay’s improvisation of it, because he never follows recipes), on my request list for home. 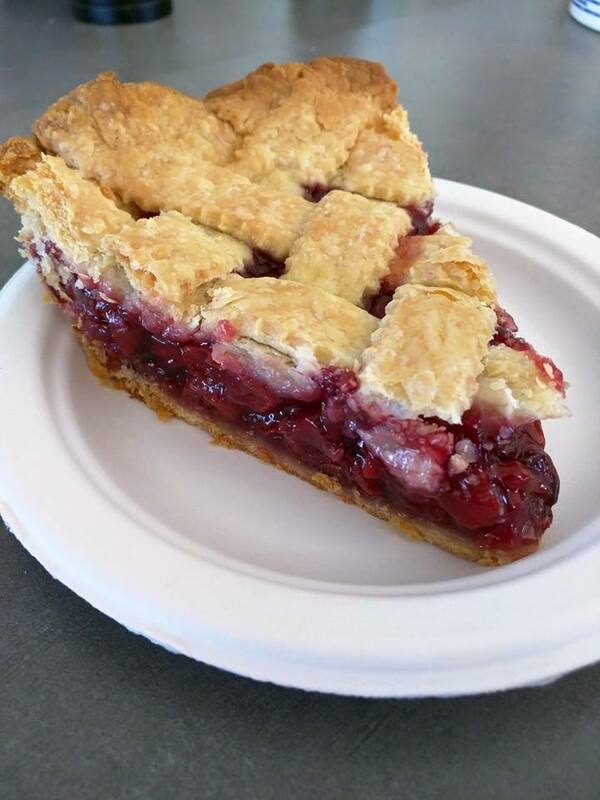 For dessert, I figured I’d make the cherry pie a few days early, and bring it to share, so that I’d have this ready to post for pi day.